Please note that this is NOT an official website. At this point in time Ronnie O’ Sullivan does not have an official website, nor does he wish to have one. I will analyse this later … tonight or tomorrow. It’s nearly time for my train. Home bound! It’s fair to say that Tian had no easy draw there. He scored really well against Ryan Day and Matthew Stevens, two experienced players, both tournament winners. And Ryan was the highest ranked player in the draw. It will mean a lot to Tian who had some painful defeats in those qualifiers in the past, notably at the hands of Fergal O’Brien. I only saw Gary Wilson in his last match at the EIS but he was impressive, and one that seeds would prefer to avoid. The first two frames did set the tone of this match: Gary won the first frame with a 134, Liang replied with a 141 in the second. Gary had seven breaks over 60 in this match, including three centuries, and whilst Liang was a bit inconsistent Gary was solid from start to finish. Where to start? Here is the youngest player in the Crucible draw. He’s only 19 and this is his first year as a pro. He’s the inaugural WSF champion. He defeated three seasoned pros this week, including Marco Fu. He has a very solid temperament. And he’s “multi-gifted”: his command of English is very good, he’s a very talented pianist and a good photographer too. Anthony McGill qualification is a statement of resilience. Even when not playing that well he’s hard to beat. Back against the wall, you can trust him to find something. One sentence here: this week Graeme played like the World Champion he was. The game face is on, the gritty “terrier” is back. Beware! The least that can be said about Li is that he earned it! His last two matches were long and very hard-fought. Some might be tempted to smile at his unusual sense of fashion, his rounded face. The man has an iron will to win. The thing that might play against him next week is that he will be even more tired than most. I didn’t watch Martin Gould at all this week. Going by the scores in his matches he’s in solid form. Not many expected Michael Georgiou to play at the Crucible, after an indifferent season (understatement). But look at who he beat! Two very hard match players in Lee Walker and Peter Ebdon were his first victims. Yan Bingtao is not in his best form, and his confidence is low, ok, but his talent remains and Michael still hard to beat him. He has every reason to be proud, he made his country proud. I hope he enjoys his debut. I didn’t watch any of Ali Carter’s matches. I can’t judge how he’s playing. In my opinion he’s not really been tested. His highest ranked opponent was Jimmy White n°79 in the rankings and turning 57 in less than a month. Zhou is returning to the Crucible. I only watched his last match, against Eden Sharav. He played a very mature game – it’s easy to forget that he’s only 21. Mark Davis is the oldest man in the Crucible draw. He’s a lovely man, popular with the fans and very, very solid at the table. He got the better of two of the hardest match players in the game before facing young Lyu Haotian. Once “Mavis” got on top of him, there was only one winner. Lyu had very traumatic experiences off the table when he came to play on the tour as a 15 years old rookie. He remains fragile. I do hope he finally gets over it one day and can do his talent full justice. I watched the first and the last match, versus Joe O’Connor. It was very high quality. Joe O’Connor is in his first year as a pro and has done tremendously well. He should be proud. “Theppy” scoring power is just too much for about anybody when he’s on form. And he is. He’s great to watch as well. Jonathan Bagley who is a WSS player and an amateur did very well actually. The match could have been closer had Jon found his ground from the start. But everything was new to him and the fist session was just a learning curve. Scott Donaldson had reached the semi-finals in Beijing so it is maybe no surprise that he did well at the EIS. What could not be expected is how the last match against Lu Ning panned out. Scott lead 7-2 and 9-4 before Lu Ning fought back to force a decider. And even in that decider, Lu Ning fought to get the snookers he needed, and got them … before Scott eventually fell over the line. By that time he probably didn’t even remember his own name! Lu Ning deserves a lot of credit. In his previous match he had defeated Mark King, which is never easy. Lu Ning is in the first year of a two years card. He’s already climbed to world n°68. Zao looked never in trouble last week. Noppon Saengkham was the one who ran him closest and it wasn’t very close. Now, maybe Noppon hadn’t got the best of preparation: getting married just before the WC qualifiers isn’t maybe ideal. Anyway I wish all the happiness in the world. I didn’t watch any of Jo Perry’s matches. I can’t judge how he’s playing, although he has obviously been scoring heavily. He may not have been really tested though. There will be six players from China in the Crucible draw this year, the five above and Ding. That’s the most there ever was. With “Theppy” that’s seven from Asia. The three youngest players in the draw are all Chinese: Luo (19) Zhou (21) and Zhao (22). Amateur James Cahill (23) is the youngest british player. Should Luo or Zhou win the title they would become the youngest ever World Champion. Stephen Hendry is the holder of that record. Zhou woul beat him by 11 days; Luo by two years and 18 days. It’s the first time that an amateur has qualified to play at the Crucible in the World Championship. James Cahill will become the first ever amateur to grace the Crucible, after he defeated Michael Judge 10-6 at Betfred World Championship qualifying in Sheffield. With both players competing as amateurs this week, the historic Crucible first was guaranteed regardless of the result. Cahill spent four years as a professional on the tour, before dropping off in 2017. However, performances as a Q School top up this term have seen him earn a tour card for next season, when he will regain his professional status. The Blackpool potter has already highlighted his big match mettle with two giant killing UK Championship wins. In 2014 he came through a final frame decider to beat Ding Junhui 6-5 during a run to the last 16. 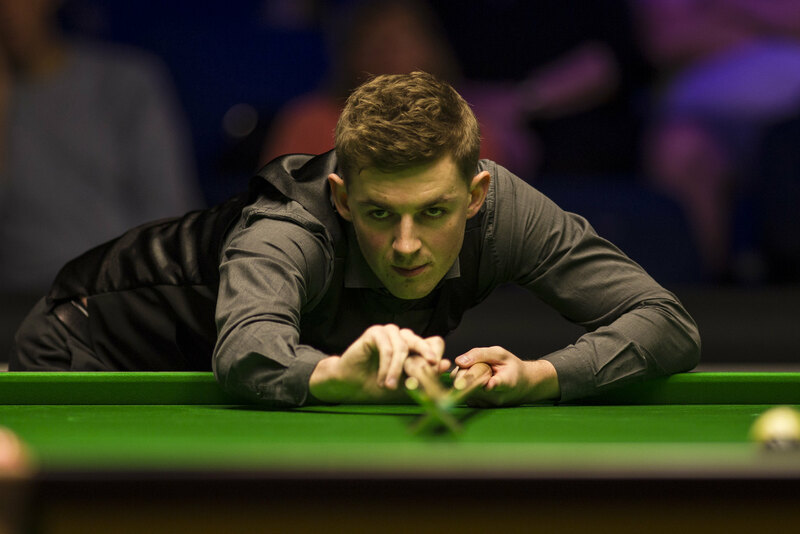 Earlier this season he downed the then world number one Mark Selby 6-3 in the opening round. Judge’s remarkable run comes to an end, but he has the consolation of £15,000 of prize money for reaching this stage. The Irishman, who spent 19 seasons as a professional before dropping off the tour in 2011, only found out last Monday he would be playing in this event after Zhang Jiankang pulled out. He went on to record two post-midnight 10-9 victories against Peter Lines and Xiao Guodong. Cahill looked composed this afternoon in the Judgement Day pressure cooker. From 8-6 up, he showed no signs of finishing line nerves, firing in breaks of 64 and 60 to push his way over the line. “This is the best buzz I’ve ever had playing snooker. I don’t think it has quite sunk in yet, but I know what I’ve achieved and it is something special,” said 23-year-old Cahill. “I’ve shown a lot of character and bottle this week. There was a lot more at stake than just qualifying for the Crucible. I’ve had to try and get my tour card for the next few years, which I’ve done. The fact that it is my first time qualifying as well added extra pressure, I made two really good 60 breaks to get over the line. Anthony McGill ensured his place in tomorrow’s draw by summoning a superb fightback to come from 7-2 down and defeat Robert Milkins 10-8. He fired his way back into contention, making breaks of 97 and 118, as he claimed seven frames on the bounce to establish an unlikely 9-7 advantage. Milkins pulled within one, but a contribution of 52 helped McGill to seal a remarkable victory. The Scot will now compete at the Crucible for a fifth consecutive season. Although he has struggled to find his best form this term, having not gone beyond the last 16 of any event. He will be hoping today’s fightback acts as a catalyst for a return to top form on snooker’s biggest stage. McGill said: “Sometimes I maybe just don’t care enough. I’m quite philosophical and sometimes I need a bit more fire in my belly. I had it today and I wish I could get that feeling for every match. I need to pick up my standard, but I’m in the event so I can turn it around. “Immediately after yesterday’s session I thought I was beat. However, the more I thought about it, the more I realised that he still had three frames to win. I knew I could make it hard for him. I actually quite fancied it when I woke up today. The tour’s fastest player Thepchaiya Un-Nooh was the first player over the line today, beating tour rookie Joe O’Connor 10-6. 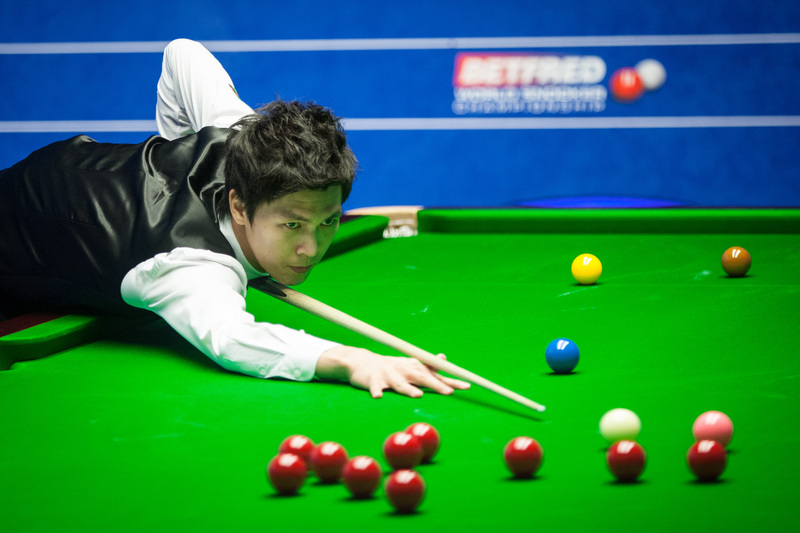 Thailand’s Un-Nooh made his Crucible debut 12 months ago, facing eventual finalist John Higgins. Un-Nooh put on a strong showing before succumbing to a 10-7 loss. Following today’s victory he stated he wouldn’t mind being pitted against the illustrious Scot again in tomorrow’s draw. Michael Georgiou defeated China’s Yan Bingtao 10-8 to secure his maiden Crucible appearance and become the first ever Cypriot to compete in the final stages of the World Championship. Prior to this week Georgiou had endured a torrid World Championship record, having suffered three first round exits and one second round defeat. However, he turned that around this week with today’s victory and earlier wins over Lee Walker and 2002 World Champion Peter Ebdon. “I don’t know what to say really. It hasn’t sunk in yet. Yan is a fantastic player and he made me work for it. Somehow I have stumbled over the line and the Crucible awaits,” said 2018 Shoot Out winner Georgiou. “It is every kid’s dream to go to the Crucible. There is so much history attached to it and now I am going to get to play there. 46-year-old Mark Davis will be the oldest player in the draw tomorrow after he secured his place with a 10-7 win over Chinese prospect Lyu Haotian. Davis is now the most successful player in the history of World Championship qualifying, having negotiated the process ten times. Zhou Yuelong defeated Eden Sharav 10-6 to secure his second Crucible appearance and end his opponent’s hopes of becoming the first Israeli to reach the final stages. While 2016 German Masters winner Martin Gould came through 10-8 against Welshman Daniel Wells. Gary Wilson secured his place in the draw with a hard fought 10-6 defeat of Liang Wenbo. It will be Wilson’s second time at the Crucible. His last appearance saw him succumb to a narrow 10-7 loss against Ronnie O’Sullivan in 2015. 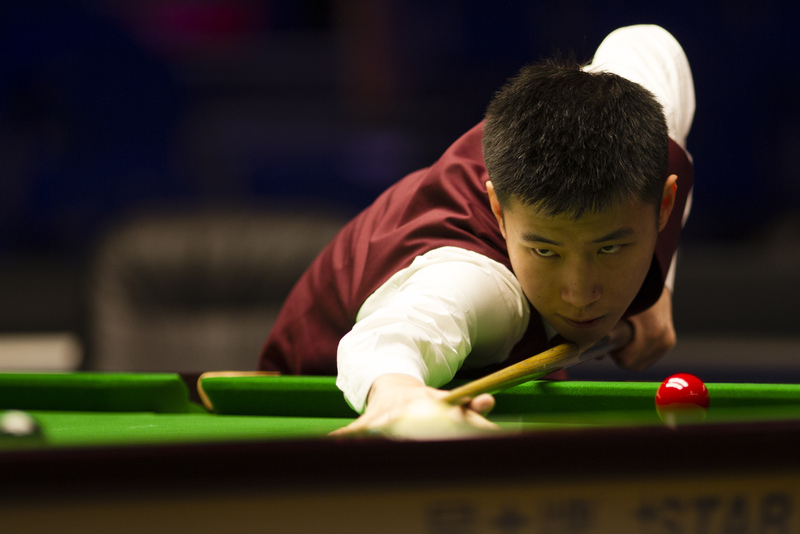 There will be four Chinese debutants at this year’s Betfred World Championship after Zhao Xintong, Luo Honghao, Tian Pengfei and Li Hang progressed at qualifying in Sheffield. They join Asian number one Ding Junhui and Zhou Yuelong in tomorrow’s draw, meaning that there will be a record six Chinese players at the Crucible this year, beating the previous best of five set in 2017. Zhao Xintong secured his debut with a sensational display to beat Indian Open champion Matthew Selt 10-4. The 22-year-old has reinvigorated his game this term. He dropped off the tour at the end of last season, before immediately securing his return through Q School. Since then he has enjoyed a superb campaign, reaching a maiden ranking event semi-final at the 2018 China Championship and making the last eight of the 2019 Welsh Open. Zhao’s improvement hasn’t come at the expense of his quickfire and attacking style of play. He’s second only to Thepchaiya Un-Nooh in terms of average shot time this season. He overpowered Selt today with his break building, making contributions of 51, 54, 124, 79, 72, 51, 103, 72 and 56 on his way to victory. 2018 WSF Amateur Champion Luo Honghao booked his maiden trip to the Crucible with a narrow 10-8 win over Tom Ford. The talented 19-year-old produced a fine display to secure his progression. Luo composed runs of 57, 64, 61, 54, 60, 106 and 66 on his way to the impressive victory. Luo had already showcased his ability in an enthralling battle against Ronnie O’Sullivan in the quarter-finals of the English Open earlier this season. He eventually lost out 5-3, but has stated he would like to face the Rocket in his opening match at the Crucible. 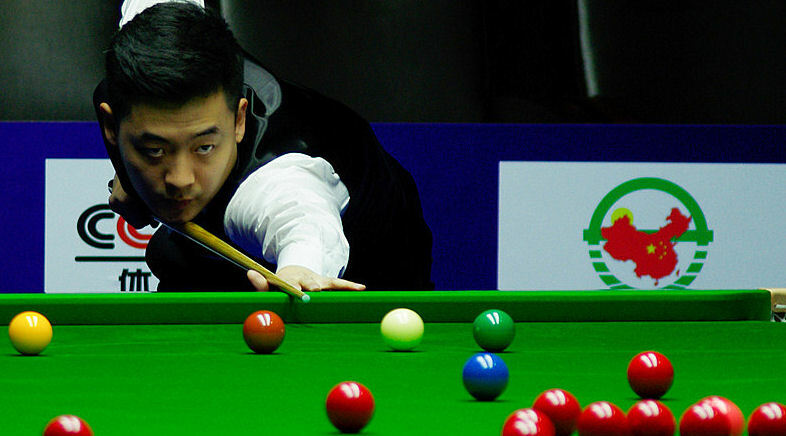 Tian Pengfei survived a Matthew Stevens fightback to progress with a narrow 10-8 victory. This was 2015 Ruhr Open finalist Tian’s 11th attempt to qualify for the World Championship and it had looked like he may have to wait another year, when two-time finalist Stevens started to cut away at his significant lead. Tian held a 9-3 advantage, before Stevens crafted breaks of 114, 95, 67, 60 and 143 as he claimed five frames in a row to make it 9-8. However, Tian showed his character by making a contribution of 56 to take the match and prevent a deciding frame. Li Hang came through a hard fought battle with Ben Woollaston 10-8 to book his Crucible debut. The 2017 China Championship semi-finalist won two frames in a row from 8-8 to clinch the victory. A relieved Scott Donaldson won an epic deciding frame to edge past Lu Ning 10-9 and book his Crucible debut. The Scot held a 9-4 advantage, before China’s Lu dug deep to force his way back into the tie and take the match to a final frame. Donaldson appeared to be over the line when he held a 64-24 advantage, with his opponent needing two snookers. Lu managed to get them, but Donaldson held his nerve and composure to pot the final red and a yellow to secure victory. That win means that in total there will be seven debutants at this year’s World Championship. Graeme Dott won his 15th consecutive World Championship qualifying match, beating Norway’s Kurt Maflin 10-2 to reach the Crucible. Scotland’s 2006 World Champion will now appear in the final stages of the World Championship for the 20th time in his career. The wins for Dott and Donaldson now mean there will be five Scottish players at the Crucible, as they join Anthony McGill, John Higgins and Stephen Maguire. 41-year-old Dott has shown impressive form this week, dropping just eight of the 38 frames he has played. Joe Perry eased past Martin O’Donnell 10-3 to book his Crucible place. The Gentleman enjoyed an even more dominant week than Dott, losing just five of his 35 frames. He thrashed Germany’s Simon Lichtenberg and China’s Zhang Yong by 10-1 scorelines in the earlier rounds. Ali Carter booked his place at snooker’s Theatre of Dreams with a 10-4 defeat of world number 102 John Astley. The Captain has now reached the final stages for 17 consecutive years, having never missed the Crucible since 2002. The draw for the final stages will take place at 11am tomorrow. You can watch it live on our YouTube and Facebook channels. For further details click here. Tonight, or early tomorrow morning we will know who are the 16 qualifiers, who will join the 16 seeds at the Crucible starting Saturday. The draw will be made tomorrow and you should be able to watch it live at 11 am UK time. I write “should” because this hasn’t exactly be going to plans in the past! And here is how you can watch the action today. Ten Asian players in the line-up, five of them under 22 years of age, including Luo Honghao a 19 years old rookie. The two youngest non asian players are Joe O’Connor and James Cahill, both 23. Joe O’Connor is also a rookie. Yesterday’s results mean that Jimmy White is now off the tour. Mike Dunn immediately came on social media, calling for him to get another invitational tour card. As much as I like Jimmy, I think he shouldn’t. The Seniors tour is developing well, and I’m 1000% behind every effort made to make it bigger and better so that players like Jimmy have a platform to play and continue to entertain. Watching him play, and get beat more often than not, in qualifiers, is sad really. Yesterday Jimmy started well, but he doesn’t have the stamina anymore for long matches. RONNIE O’SULLIVAN has been dealt a blow on the eve of the World Snooker Championship after his coach was banned from visiting his training base. 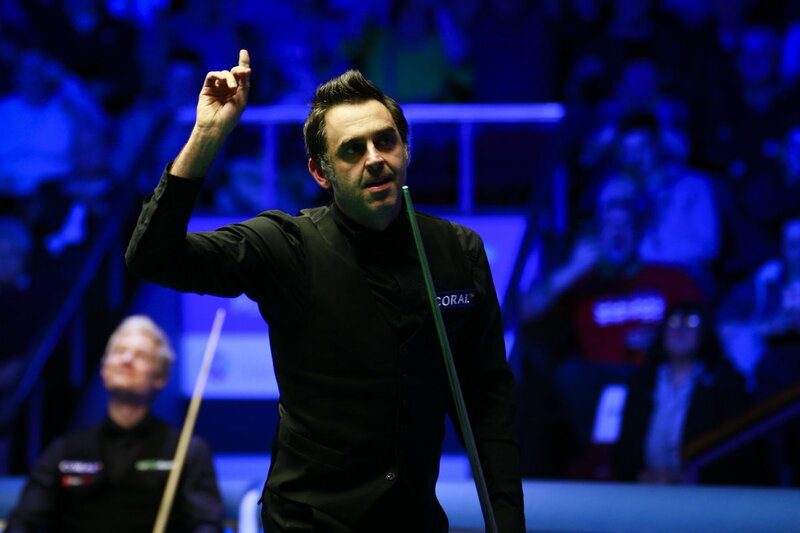 Ronnie O’Sullivan linked up with Stephen Feeney last year after he turned Mark Williams back into a world champion. Williams, 44, won his third Crucible title in May 2018 and O’Sullivan decided to get the mastermind behind that success on board. Feeney appears to have had a major impact on The Rocket after his stunning season which has seen him return to the world No.1 spot and claim five major titles. But his progress could be hit after his coach was banned from O’Sullivan’s Romford training base. O’Sullivan has practiced at the Grove Academy in Romford, Essex, for years. But he’s had to change his plans for the 2019 World Snooker Championship, and will instead head to Sheffield. The Grove Academy is owned by O’Sullivan’s former manager Django Fung, and he’s banned Feeney from entering the venue – although the player himself is still allowed in. Fung manages fellow snooker stars Judd Trump and Neil Robertson and disrupting O’Sullivan’s preparations could give them a big advantage. This happened 10 months ago. No one is banned, I just need to know who enters my premises and when. Also don’t need any unwanted distractions to my players. I explained this to @ronnieo147 and he fully understands it. Clearly someone is making a “drama” story out of nothing. The article is inaccurate and misleading. Unfortunately many will only read the article, comment on it and share it and will not see – or will deliberately choose to ignore Django’s answer… because they like to stir the pot. I have seen this type of things often enough when I was in the media room. Quotes from players, taken out of context, twisted, presented as spontaneous when they had been baited into it. Just to create “stories” that sell, in total disregard from what the players actually meant. And it’s all the most easy to do when they are interviewed, only minutes after a match, especially when they are feeling raw having just lost. Don’t get me wrong, there are many journalists out there who genuinely do their job the best they can, trying to promote the sport, to sell articles to their – too often reluctant – editors whilst being fair to the players. But you have the others as well … like this one. You can read here what it means for the players in terms of surviving on the main tour. Three players currently in the relegation zone have still a chance to stay on tour: Jimmy White, Xu Si and Zhang Yong. However they need to qualify for the main event to do so, and, should more than one of them manage that, they would need Nigel Bond and/or James Cahill to lose next round. Peter Lines will feel a bit aggrieved. Indeed his opponent, Zhang Jankiang, withdrew, and was replaced by another “veteran”, Michael Judge, a former pro who has been a regular on the Seniors Tour all season. A win or a bye would have placed him in the top 8 of the one year list. Joe Swail was gutted to lose his professional status, but has been suffering with tinnitus for years (Joe is partially deaf). It has affected him both in his every day life and at the table. Despite the sore disappointment of dropping off the tour, Joe has vowed to take care of his health first and then consider playing in the Seniors Tour. Robin Hull also suffers health issues and had previously announced that he could retire at the end of this season. He suggested that his decision would be made after the World Championship. Now, it is rumoured that he’s entered the Q-school. If that’s true then obviosly he does want to give it another go. Dominic Dale is safe through the one year list, but should he win his round two match as well he would climb into the top 64. He would then send Mike Dunn in the relegation zone and free one spot in the one year list, currently benefitting Alexander Ursenbacher. Liang Wenbo broke a record in his demolition of poor Basem Eltahan: he set a new points without reply record for the World Championship – 493 (Previous record 485, Higgins v Hamilton in 2000). Largely unknown amateur Pang Junxu, 19 years old, beat Stuart Carrington, and quite comfortably too. Not many saw that coming! If I’m not mistaken he’s CBSA nominee in this. Ng On Yee ran Alan McManus extremely close. She had been trashed in those qualifiers previously, but this time she stayed with a the very experienced “Angles” up to the last MSI. Alan then pulled away. In fact it was 6-6 at the last MSI and On Yee had never been behind. To the surprise of many – but not me – Fergal O’Brien comprehensively beat Jackson Page. Page went 3-0 up … before “diesel engine” Fergal kicked in. After that it was largely one way traffic. Even if Jackson had gone 5-0 up, I would still have fancied Fergal to win. To me Jackson Page is over-rated. I’m not doubting his talent, but his game is still very incomplete. That’s not unusual for someone that young, and he has a lot of time to learn. I’m not convinced however that the hype around him is doing any good.